Nine-year-old golfer Avery Zweig is kicking off her efforts to Win “Green” for Cason, a Louisiana boy recovering from cancer. It all starts at this year’s Drive, Chip and Putt competition at The Masters, where Avery will be shooting for the championship for girls ages 7 through 9 years old. After that, she’ll be earning pledges and donating the proceeds of this year's “Win Green” campaign to help two-year-old Cason Crow. Cason is from Monroe, LA, and was diagnosed with neuroblastoma last August after doctors found a tumor in his neck. Cason got treatment at St. Jude’s Children’s Research Hospital in Memphis and his doctors say the tumor is no longer active. However, the effects of the illness have depleted his family’s finances. His mother Caitlin resigned from her job as a nurse to provide full time care for him. The illness has created a loss of income for the family due to the recurring care Cason needs each day. Per the Crow Family's wishes, a majority of the proceeds will be donated to St. Jude Children's Research Hospital as they have been instrumental in Cason's fight! The balance will help the Crow family directly. Last year, through a partnership with the 2 Seam Dream Foundation and Rick Greene, Avery managed to raise almost $10,000 for the Brentfield Elementary School Custodian (Mr. Jeff Ballard AKA “Superman”) to aid in his fight against lung cancer. This year, she is looking to raise $25,000 for St. Jude Children’s Research Hospital, little Cason and the Crow Family. Due to last year's overwhelming success, the “Win Green for Cason” campaign will now have 3 girls playing for this one little guy. New additions to the team are Gianna Clemente and Madison “Mad Dog” Moman. 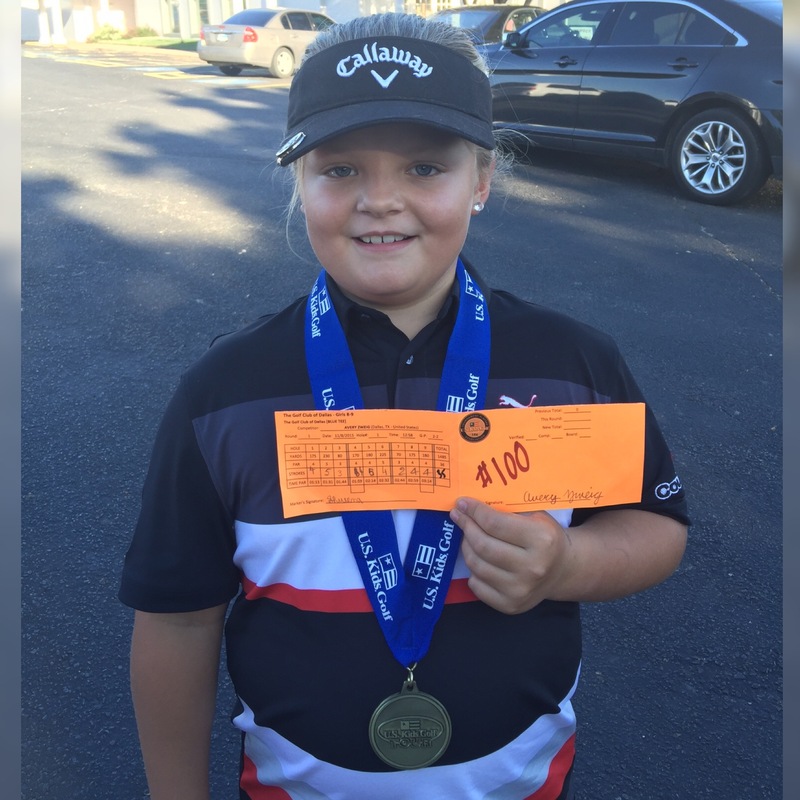 Gianna is the current 7-and-under US Kids Golf World Champion and will be playing out of the Ohio Area for Cason. Madison “Mad Dog” Moman, who is a top-ranked US Kids Golf star and “soon to be 9 year old,” will be playing for Cason out of the Florida / Southeast region. It is Avery Zweig’s short term goal to grow the “Win Green” campaign so that it has nationwide coverage with elite players attempting to “Win Green for those in need" each and every year. Avery Zweig is currently ranked #1 in her class of 2025 in the Junior Golf Scoreboard. She has won over 100 tournaments in her brief career, highlighted by her personal best score from the Women’s Red Tees (while age 8) of 74. Avery also holds the NTPGA scoring record (9 holes) relative to par with an -8 under par 28 on July 2, 2014. She has been profiled in USA Today, the New York Daily News, WFAA in Dallas, as well as featured on the 10-week Docu-series “The Short Game,” which was featured on the Esquire Network from January through March of 2015. You can learn more about Avery at http://www.averyzweig.com.